AK Sajan's "Puthiya Niyamam" is expected to be the first blockbuster of Mammootty in 2016. Mammootty and Nayantara starrer "Puthiya Niyamam," released on Friday, Feb. 12, has opened to positive reviews from audience and critics alike. The AK Sajan directorial is said to be next blockbuster of the megastar after Salim Ahamed's "Pathemari," which rocked the box office in India and abroad. From the buzz on social media, Nayanatara has a major role and steals the limelight in the crime thriller. This is said to be her career best until now. Audience are heaping praises on the actress for her never-seen-before avatar as a Kathakali artist Vasuki Iyer, wife of Adv. Louis Pothen, played by Mammootty. Apart from Nayantara's notable performance with Mammootty, which is said to be the USP of the movie, cinematography by Roby Varghese Raj and Vivek Harshan's editing are also garnering good response from critics. However, Gopi Sundar's music has been receiving mixed reviews. Sheelu Abraham who portrays the role of a rough and tough cop Jeena Bhai IPS, Rachana Narayanankutty, Aju Varghese and scriptwriter SN Swamy too deserve a special mention. With "Puthiya Niyamam" getting good reviews as a convincing thriller, the AK Sajan directorial is expected to be the first blockbuster of Mammootty in 2016. 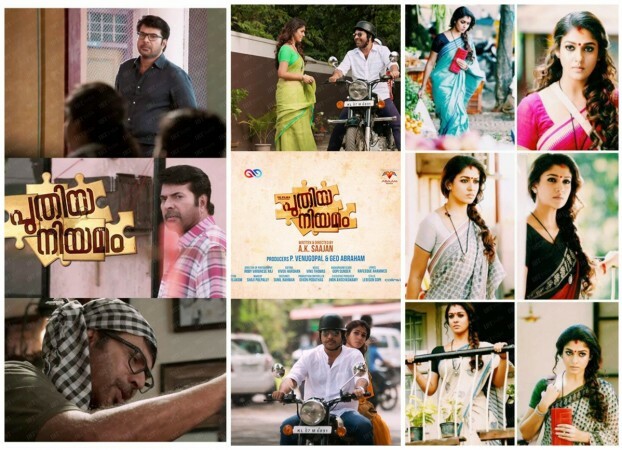 Read more: Audience response on "Puthiya Niyamam"
Puthiya Niyamam is a movie that won't disappoint you for sure. Just like how George Kutty (Mohnalal in Drishyam) got applauds in the second half of Drishyam, the last 10 or 15 minutes of the movie has a series of moments that will make you clap for the hero Puthiya Niyamam is a last minute thriller that uses its flaws smartly to be a pretty satisfying thriller. Don't expect an out and out thriller package. Just have the patience to sit through it and you won't feel cheated for sure. Nayanthara looks stunning and delivers a clean performance as Vasuki. Sheelu Abraham as Jeena Bhai, the rough and tough cop takes out a never seen before act. Rachana Narayanankutty as Kanimani also deserves a special mention. Aju Varghese and Scriptwriter SN Swamy also surprise the viewers with their change of usual roles. Puthiya Niyamam is for those who love crime thrillers with a family setting on the surface and turbulent and criminal tones hidden inside. Roby Varghese Raj's cinematography was very good and Vivek Harshan's editing had made the flick crisp. Gopi Sundar's music was good at places and at some parts it become unbearable as well. The film follows a medium pace throughout and gets the speed only at the climax part. Puthiya Niyamam is a onetime watchable decent thriller, which will not let you down if you go with less expectation. The film had everything in it but not a single scene was deliberately included in it to make it a showpiece. It only had what it needs. Vivek Harshan's editing was also made it tight and sharp. In Total, Puthiya Niyamam is a family thriller which will make you thrill. It has all family emotions in it to make you glued to the seats and at last will make you thrilled as well.